At HPS, we inventory a wide variety of high-quality monoblock and modular mobile control valves in a variety of flow rates from the world’s leading valve designers and manufacturers. Danfoss has a broad range of valves designed for your machines most demanding tasks – integrating multiple functions in a compact package, they provide strong, smooth and consistent performance. The modular electrohydraulic valves provide an almost infinite number of configurations – from simple load sensing solutions to CAN bus communication – ensuring smooth machine control. Husco International is a global leader in the development and manufacture of hydraulic and electro-hydraulic controls for off-highway and automotive applications. Husco International manufacturers mobile hydraulic control valves that satisfy control requirements up to 950 lpm and 350 bar and applications for both open center and closed center systems. Hydra-Power Systems stocks and distributes the following Husco International Products: Hydraulic control valves. Bucher Hydraulic manufactures innovative hydraulic drive and control technologies for mobile and industrial hydraulic applications, specializing in compact, economic hydraulic systems that also improve performance. Bucher parts are made to exacting technical standards, and the company has been supplying mobile valves for construction machinery, conveyor technology, industrial machine construction and agricultural applications for decades. Hydra-Power Systems stocks and distributes the following Bucher Hydraulics products: Sectional Control Valves. Muncie is renowned for its comprehensive line of mobile power components and systems for dump trucks, roll-off hoists, wreckers, aerial bucket trucks, tank trucks, truck mounted cranes and more.Hydra-Power Systems stock and distributes the following Muncie Products: Hydraulic control valve. 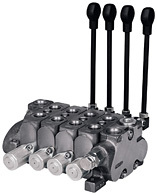 Brevini is a leading manufacturer of directional control valves, in two versions: monoblock and modular. Monoblock, available in up to 6 selections, with flow rates 35 and 60 l/min. Modular versions offer flow rates of 35, 60, 100 and 200 l/min. All Brevini valves are suitable for 350 bar working pressure.